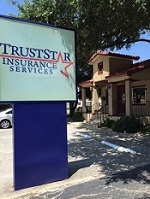 Locally owned and operated, TrustStar Insurance Services has delivered quality insurance solutions to individuals in Texas, specializing in Business, Homeowners, Auto, Life and Health insurance coverage. Our team of experienced insurance professionals is committed to helping you find a policy that fits your needs. We focus on providing individualized attention and exceptional customer service to create an experience that’s difficult to find in today’s market. At TrustStar Insurance Services, we’ll work with you to ensure that you and those you care about most are protected. TrustStar Insurance Services is a proud member of the TexStar Bank family and fully owned by TexStar Bancshares, Inc. TexStar Bank is ranked the "4th Healthiest Bank in America" by DepositAccounts.com.